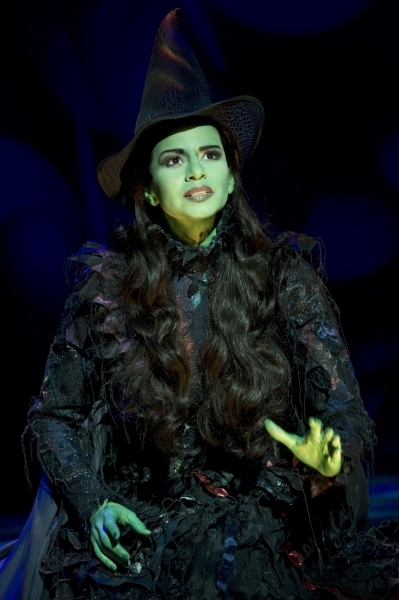 Wicked Broadway grossed $1,565,019 for the week ending April 25, 2010. Wicked Again occupies the top place in the list. Below are the Top 10 Grosses from BroadwayWorld.com for the week ending April 25, 2010. 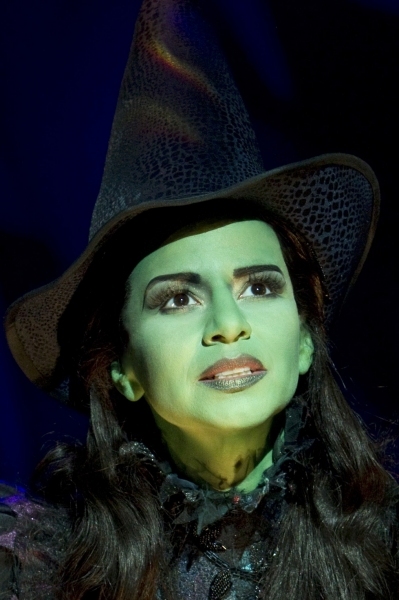 Mandy Gonzalez, who originated the role of Nina in the Broadway musical, In the Heights, joined WICKED as Elphaba in late March. Mandy joins a cast which includes Katie Rose Clarke as Glinda, Tony Award-winner Rondi Reed as Madame Morrible, P.J. Benjamin as The Wizard, Andy Karl as Fiyero, Alex Brightman as Boq, Jenny Fellner as Nessarose, and Timothy Britten Parker as Dr. Dillamond. Mandy Gonzalez was last seen on and off-Broadway in the Tony Award-winning musical In The Heights, where she originated the role of Nina Rosario (Drama Desk Award/Ensemble). Other Broadway appearances include Lennon, Aida, and Dance of the Vampires. Mandy received an OBIE Award for her performance in the Off-Broadway production of Eli’s Comin’. Film/TV: “The Good Wife,” “One Life to Live,” “The Guiding Light,” “Third Watch,” and recently completed the film After. Mandy can be heard in Disney’s Mulan 2 as the singing voice of Mei. Wicked is performing at the Gershwin Theatre, 222 West 51st Street. Buy Wicked Gershwin Theatre Tickets. “Wicked” is closing its record-breaking San Francisco run. The return engagement of the insanely popular “Wizard of Oz” prequel will close on Sept. 5 after some 660 performances in the city where the show was first born. Theater officials say the blockbuster musical must close to make room for the revival of “West Side Story” and other touring shows in the SHN/Best of Broadway series this fall. So far, more than 1 million theatergoers have seen “Wicked” in San Francisco, and the production, which began in January 2009, has grossed more than $75 million. For the record, “The Phantom of the Opera,” which ran for five years, still holds the record for the longest-running Broadway musical in San Francisco history. “Wicked,” dubbed the “best musical of the decade” by Entertainment Weekly, made its world premiere in San Francisco in 2003 before becoming a pop-culture juggernaut. A girl power revamp of the L. Frank Baum mythology, “Wicked” is based on the popular books by Gregory Maguire with music and lyrics by Stephen Schwartz. Wicked will be coming to the Majestic Theatre in San Antonio, Texas from February 16 to March 06, 2011. The 2011 Wicked Cast for Madison includes Vicki Noon (Elphaba), Natalie Daradich (Glinda), Marilyn Caskey (Madade Morrible) and Don Amendolia (The Wizard). Buy Wicked San Antonio TX Tickets Online. Receive 15% Off Wicked Ticket Orders Over $200! After breaking box office records and selling out in record time in 2005 & 2007, WICKED, the smash-hit musical, will return to the Fabulous Fox Theatre in St. Louis, June 16-July 11, 2010. Tickets for the return engagement go on sale Sunday, April 18 at noon. Ticket prices range from $33 – $80 depending on performance date and seat location. Buy Wicked Fabulous Fox Theatre-St. Louis MO Tickets. WICKED is returning to the Fox after two previous record-setting engagements. Curtain times for this limited four-week run are Tuesdays through Fridays at 8 p.m.; Saturdays at 2 & 8 p.m.; and Sunday at 2 & 7:30 p.m. Additional performances are: Thursday, June 17 at 1 p.m.; Monday, June 28, 8 p.m. and Thursday, July 1 at 1 p.m. with no show on July 4. Based on the best-selling 1995 novel by Gregory Maguire, Wicked, winner of 26 major awards, including a Grammy® and three Tony® Awards, is the untold story of the witches of Oz. It is produced by Marc Platt, Universal Pictures, The Araca Group, Jon B. Platt and David Stone. Called “a cultural phenomenon” by Variety and just named “the defining musical of the decade” by The New York Times, Wicked continues to thrill audiences around the world. There are currently eight productions of Wicked worldwide, including two North American tours, a Broadway production, San Francisco production, London production, a Japanese-language production, a German-language production and Australian production. A Dutch-language production of Wicked will open in 2011. Buy your Wicked Saint Louis, MO Tickets now! Don’t miss your chance to see Wicked when it plays at the Stranahan Theatre in Toledo, OH till April 18, 2010. This Broadway smash hit is based on the novel Wicked: The Life and Times of the Wicked Witch of the West. It is the story of the Wicked Witch of the West and her path from school girl to revolting witch. The story all takes place long before Dorothy made her turbulent entrance into the Land of Oz; however the musical is wrought with references to the classic book and film. The songs in this musical were penned by Stephen Schwartz and are amazing. In 2003, the musical premiered in San Francisco and thereafter moved to Broadway. The show has since become a huge success among fans and has crisscrossed North America a few times. box office records have been shattered by Wicked and the show has been seen by more than 2 million people. The Broadway production grosses more than a million dollars a week, and the “Sold Out” sign is actually nailed down. It has been nominated for several Tonys and took home “Best Actress”, “Best Scenic Design”, and “Best Costume Design”. It also won six Drama Desk Awards for the Book, Director, and Costume Design. In 2009, it became the 20th longest-running show in Broadway History with more than 2,550 performances played. This is your chance to see one of Broadway’s hottest shows in your own town. Pick up your Wicked Tickets NOW. We have all the tickets to this summer’s hottest Broadway shows, concerts, and sporting events. Keep checking the blog for up-to-date information! Buy Wicked Tickets in Toledo now! Wicked, recently voted London’s ‘Most Popular Show’ (2010 Laurence Olivier Awards) and ‘Best West End Show’ (2010 Whatsonstage.com Awards), welcomes its brand new London cast from tonight (29 March, 2010). Wicked now stars: Rachel Tucker (Elphaba), Louise Dearman (Glinda), Lee Mead* (Fiyero), Julie Legrand (Madame Morrible), Clive Carter (The Wizard), Cassandra Compton (Nessarose), Julian Forsyth (Doctor Dillamond), George Ure (Boq), Nikki Davis-Jones (Elphaba Standby) and Sarah Earnshaw (Glinda Standby). *Lee Mead will play Fiyero from Monday 10 May 2010. Until then the role will be played by Lewis Bradley. Cast subject to change from 7 February 2011. Wicked has already been seen by almost 3 million theatregoers and grossed in excess of £95 million at the UK Box Office since its London premiere at the Apollo Victoria Theatre in September 2006. Compare and Buy Wicked London GL Tickets Online. Morrison Center is proud to announce its exciting Fred Meyer Broadway In Boise : 2010-2011 Broadway Season which will feature the premiere of Wicked Musical – May 4-15, 2011 at The Morrison Center. Called “a cultural phenomenon” by Variety and just named “the defining musical of the decade” by The New York Times, Wicked continues to thrill audiences around the world. Winner of 35 major awards, including a Grammy® Award and 3 Tony® Awards, there are currently eight productions of Wicked worldwide. Wicked Musical will play Boise for two weeks, which has not been done with another Broadway show in Boise since the year 2000. Buy Wicked Boise ID Tickets Online. The national tour of “Wicked” will play at the Saroyan Theatre April 6 -17, 2011, as part of the next Broadway in Fresno season. The only way for the next few weeks to get Fresno tickets to “Wicked” is to be a renewing season subscriber. On April 16, new season ticket subscriptions go on sale. Individual tickets for “Wicked” will go on sale at a later date. Currently a long-running “sit down” production of “Wicked” is playing at San Francisco’s Orpheum Theatre. Buy Wicked Fresno CA Tickets Online.